LAS VEGAS, Nov. 1, 2018 /PRNewswire/ -- Caesars Entertainment Corporation (NASDAQ: CZR) announced today an unprecedented 15-year partnership that will make Caesars Entertainment (Caesars) the first founding partner of the Las Vegas Stadium, the future home of the Las Vegas Raiders, elevating Caesars' profile in professional sports. "The Raiders are proud to welcome Caesars Entertainment as a founding partner of Las Vegas Stadium," said Marc Badain, President of the Raiders. "We are honored to align with a company that shares the Raiders' values of improving the local community and delivering exceptional customer service in creating this transformative project." "Sports have long been a core part of the Caesars experience," said Chris Holdren, Chief Marketing Officer for Caesars Entertainment. "With this deep partnership, Caesars will become an essential part of the game time ritual for Raiders fans everywhere. 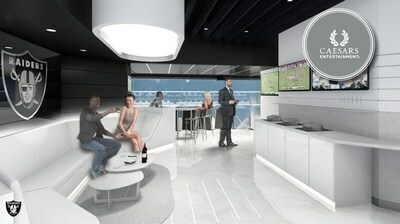 From activations to exclusive experiences, fans of the silver and black will see Caesars as their home on game day." As a Founding Partner, Caesars Entertainment will host a branded stadium entrance and drop off zone, digital signage, media, radio and print assets in addition to alumni, player and cheerleader appearances – giving the company a commanding presence. This partnership with the Las Vegas Raiders follows the company's recent announcement with the Baltimore Ravens, Maryland's only partnership between a National Football League team and a casino.